Reports from the lab: General Science: Which chip is the greasiest? General Science: Which chip is the greasiest? Purim is over, and like many of you my house is filled to capacity with chips, candy, chocolate, and other junk. As I sorted through all the snacks I couldn't help but wonder...which potato chip is the greasiest and more importantly, how can I be sure? Today the kids helped me with these questions by carrying out 3 tests. The first 2 were a touch and a taste test in which the kids rated the chips on a scale from 1-5, with 5 being the greasiest. Then the kids performed a more quantitative test where they crushed 3 grams of each chip on a piece of graph paper and then compared the different oil stains. Some kids decided to weigh the paper before and after smashing the chips, some compared how translucent the paper became, and others did their best to count the squares. Then we tested our TESTS. We read the nutritional information on the wrappers and reviewed our data to see which test was actually the best. Surprisingly the touch test was the most accurate. The kids concluded that the oil stain test could have been improved by controlling how people crush the chips and for how long. 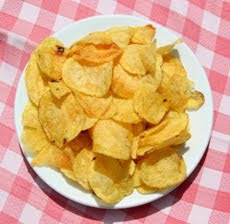 FYI Osem Chipsy Chips contains more fat than Herr's Ketchup Chips or Pringles (sour cream and onion).